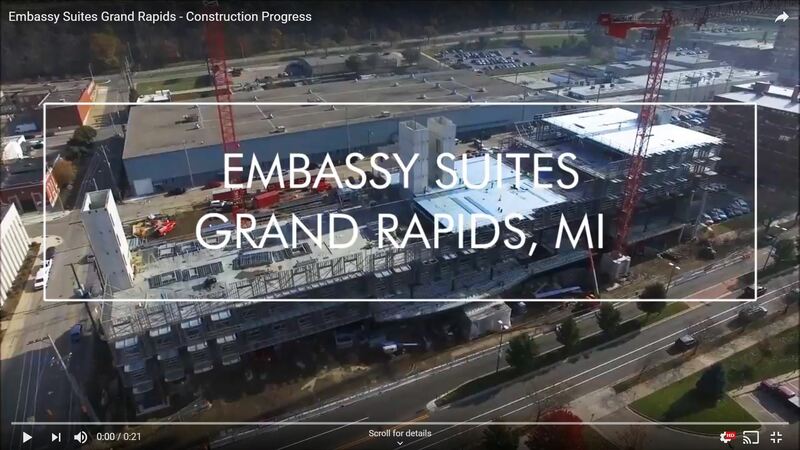 11:45 am - 12:15 pm Welcome by BOMA WM President, lunch Gold Sponsorship Commercial by Elevator Service Inc.
Join BOMA West Michigan members and guests to tour the new Embassy Suites by Hilton Grand Rapids Downtown. Owned and operated by Suburban Inns, this new build (in conjunction with Pioneer Construction) was completed early this year. Located in the Monroe North district, this hotel is in the heart of a neighborhood rich with shopping, restaurants, night-life and outdoor activities. The newest Embassy Suites is located at 710 Monroe, near the 6th Street Bridge. 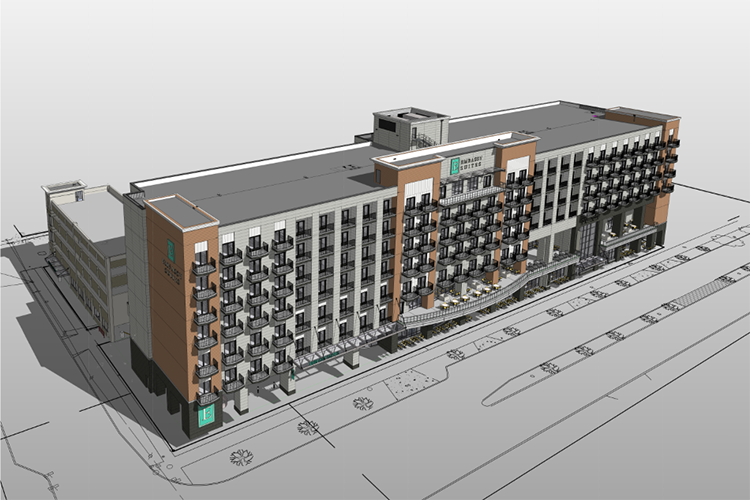 The seven-story hotel has 250 rooms and 440 parking spaces. It also features a Big E’s Sports Grill on the first floor and a large banquet facility. Construction on the hotel began in the Spring of 2017. Suburban Inns (who owns and manages the property) partnered with Pioneer Construction and the project was recently completed. Founded in 1979 by Peter R. and Carol Beukema, Suburban Inns develops, owns, and operates seven hotels in Michigan: the Hampton Inn of Holland, the Holiday Inn Express of Holland, the Holiday Inn Express of Grand Rapids SW/Grandville, the Holiday Inn of Midland, the Courtyard Marriott of Holland, Hilton Garden Inn Grand Rapids East and the Embassy Suites Grand Rapids Downtown. Suburban Inns also owns and manages Big E’s Sports Grill in Holland, Midland and Grand Rapids, as well as Sharkee’s Bar and Grill in Holland.